AQUA Net has been specially designed for vertical installation with the inlet at the bottom and the outlet at the top. AQUA Net is ideal for small capacity devices and small areas, and can be applied to pipe fittings, hydro-cleaning machines and beverage distributors. AQUA Kid handles medium capacity while featuring reduced dimensions. The head of the Aqua Kid has a three way coupling to allow straight line or square assembly, depending on the size of the installation. AQUA Kid Eco is the alternative to the classical Aqua Kid container. While featuring the same technical characteristics, the head on the Aqua Kid Eco has a different look, and the container comes in an economical package. AQUA Kid Eco is the alternative to the classical Aqua Kid container. While featuring the same technical characteristics, the head on the Aqua Kid Eco has a different look, and the container caomes in an economical package. 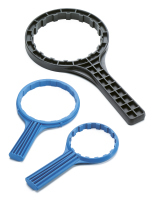 Short line filter housing range of accessories, including spanners, bracket and diffusers.